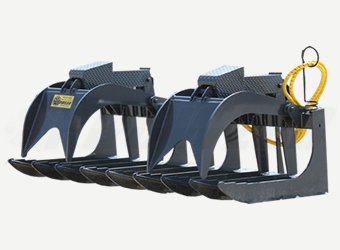 The Prowler Root Grapple line is an absolute necessity on many job sites and in many work environments. 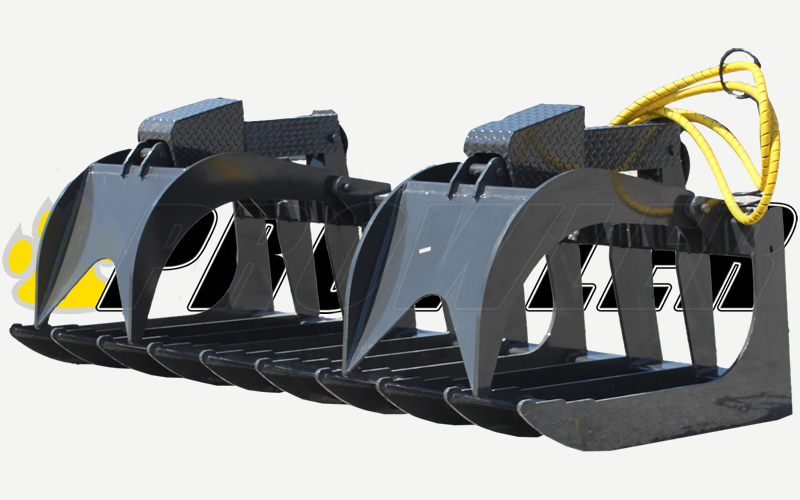 Open bottom framing allows the grapple to handle large trees, stumps, building material, rocks and more, while the small debris falls to the ground. Root Grapples are very versatile as the frontal tines allow the attachment to pull roots, small stumps, and rocks during land clearing. In demolition and storm clean up these same tines help to force the bucket in to jammed debris and act as a wedge to force its way into the piles and grab a larger amount of material per scoop. The Root Grapple is ideal for moving logs, brush, rocks scrap and building material or just about any other type of debris. The dual hydraulic cylinder models operate independently to adjust for uneven loads. 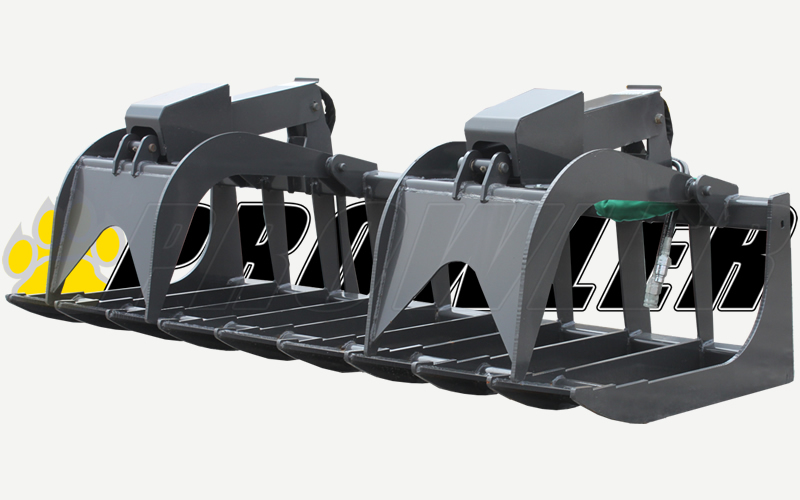 All of our Super-Duty series root grapples are built with 1/2 inch high quality plate steel with greasable pins and bushings at all hinge points. Every unit exceeds the lifting capacity of the skid steer machine it is used on. Please keep in mind that any modifications requested by the buyer, such as extra tines as an example, may require a custom build that could take 3 to 4 extra weeks to complete if one is not already in stock. Please call for availability. 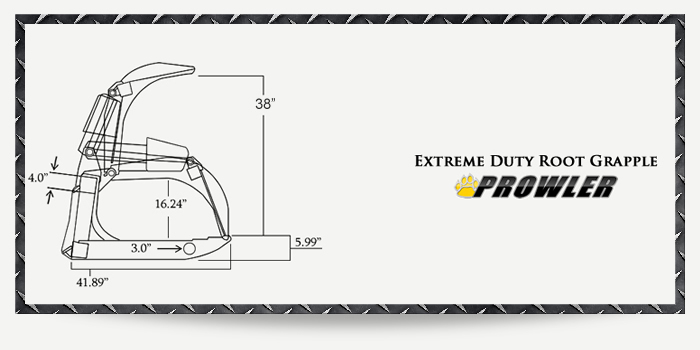 Our Standard Duty Root Grapple is built from 3/8″ thick steel plate on the top and bottom. We also incorporate 3″ square tubing. To prevent tears in the hydraulic lines, we put sleeves on the hoses and route them inside the tubing. These things add longevity to the Standard Duty Root Grapple. The Standard Root Grapples are made for machines with 35 to 45 horse power. It can handle a lot of the jobs that most people need to get done with out having to spend the extra dollars it cost for the Heavy Duty and Extreme Duty models. 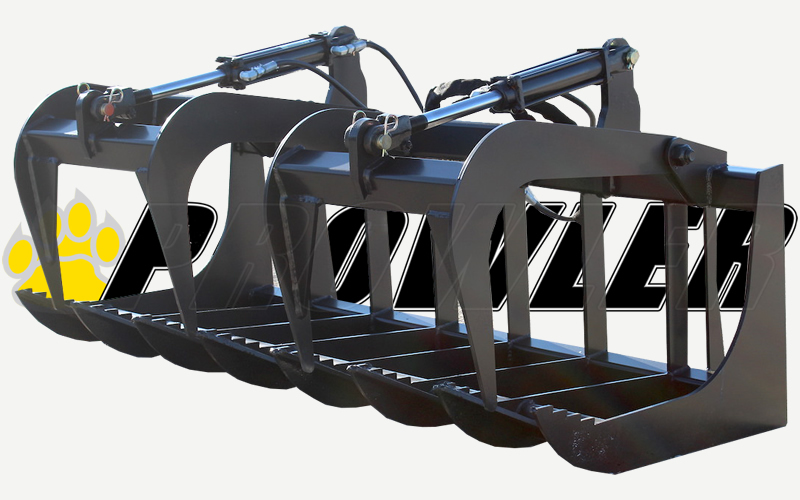 Our Heavy Duty Root Grapples are built from 1/2″ thick steel plate on the top and bottom. We also incorporate 3″ square tubing. 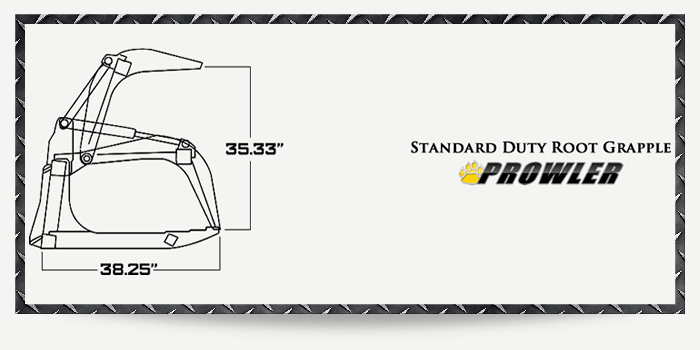 The Prowler Heavy Duty Root Grapple recommended machine size should run between 45hp and 65hp. Our Heavy Duty Grapples are our top selling model line, mainly because of a larger number of Skid Steers that operate within this horsepower range. What makes this root grapple different is the thickness of the steel plate which is 1/2″ top and bottom compared to our Standard Duty Root Grapple that has 3/8″ top and bottom. The tubing on both of these series are 3″ square that strong enough to support the work load a 65hp machine could deliver. The Extreme Root Grapple is the attachment of choice for those work in very harsh applications. It can handle more material and is more rugged than our other root grapples, for obvious reasons. It is built from 5/8″ thick steel plate on the top, 1/2″ on bottom, and incorporates 4″ square tubing. It also features enclosed hydraulic cylinders and shafts. It was built in mind for the big Skid Steer and Compact Track loaders that have 65 horsepower and more. The Extreme Root Grapple can handle pretty much anything you need to move or rip out. The rod and cylinder diamond plate covers come standard on the Extreme model giving it the look it so deserves. This grapple can pick up heavy logs, and large amounts of debris without worry. It is the one to have for big storm cleanups and natural disasters. You can rest assure that the Extreme Duty Root Grapple will last for many years to follow.